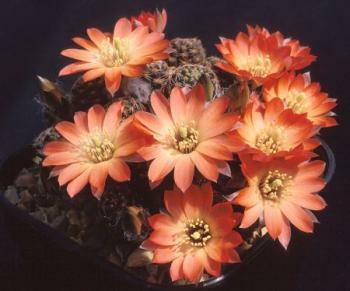 Rebutia haagei is another species with a complicated taxonomic background. 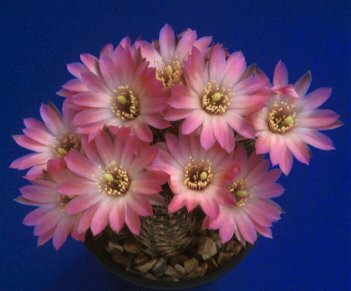 It is also known as R. pygmaea v haagei, it was originally known as Mediolobivia haagei and it is classified by some taxonomists as a Lobivia. To further complicate the situation as well as the type species, there are also several distinct varieties in cultivation. Certainly its growth habit is typical of the plants which used to be called Mediolobivias. Its smallish, elongated stems clump readily and its flowers are a lovely blend of salmon, apricot and pink. 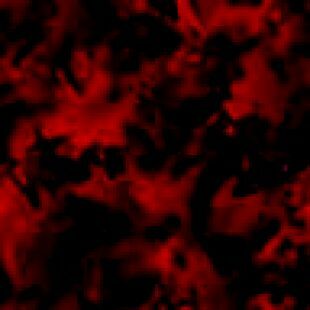 The flowers of the varieties also tend to have two-tone petals, but the colouration can vary considerably.